One of the most prominent figures to attend this year’s HIMSS Conference in Orlando–the industry’s largest gathering of healthcare IT professionals–is the newly appointed national coordinator for health information technology, Karen DeSalvo, M.D. On day two of the conference, she made an appearance at the HIMSS 2014 Interoperability Showcase, choosing to visit only six of the hundreds of displays showcasing interoperability solutions across the continuum of care. One of the displays she chose to visit was the one jointly produced by HEALTHeLINK, the Western New York health information exchange, and Orem Utah-based IMAT Solutions, a leader in healthcare data aggregation, normalization, reporting and analytics. The HEALTHeLINK and IMAT Solutions display was titled De-Identified Diabetes Registry Data and HEDIS Analysis Data. It highlighted how HEALTHeLINK and its stakeholder organizations are leveraging a “No Data Left Behind” strategy to create a data repository for data extraction, exchange, and analysis. In particular, the use of cutting edge technology from IMAT Solutions and de-identified diabetes registry data went a long ways to highlight the ability to perform HEDIS analysis and ad-hoc querying capabilities from throughout the community. This approach serves to demonstrate how Health Information Exchanges can utilize technology, data, and partnerships to further expand the value and services offered to the community and help to achieve true interoperability. 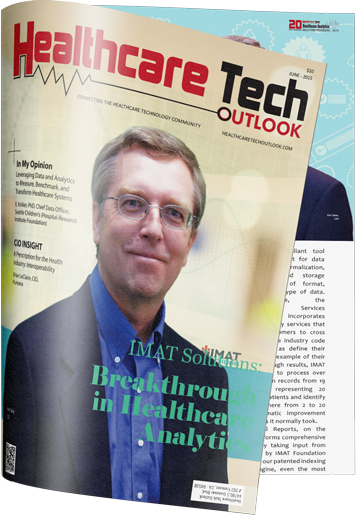 Founded in 2007, IMAT Solutions began with building the world’s fastest, most accurate search technology and then coupled it with innovations in handling and utilizing medical data. IMAT is composed of a selection of modules that allow organizations to tailor the product to their needs.